(2018). "Promogran Prisma Matrix ". In (Eds.) , WoundReference. Available from: https://woundreference.com/app/topic?id=promogran-prisma-matrix. Retrieved on 4/25/19. 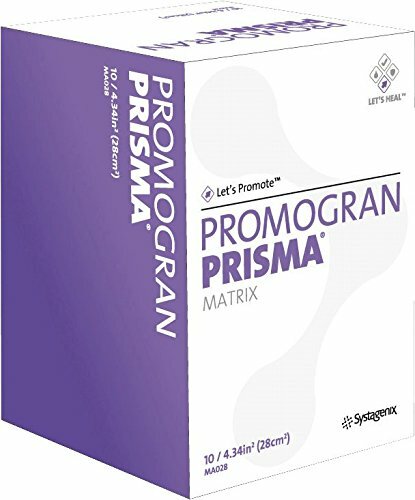 PROMOGRAN PRISMA™ Matrix is comprised of a sterile, freeze dried composite of 44% oxidized regenerated cellulose (ORC), 55% collagen and 1% silver-ORC. Silver-ORC contains 25 % w/w ionically bound silver, a well-known antimicrobial agent. PROMOGRAN PRISMA™ Matrix maintains a physiologically moist microenvironment at the wound surface. This environment is conducive to granulation tissue formation, epithelization and optimal wound healing. Ionically-bound silver is an antimicrobial agent. Promogran is used for the management of: Diabetic ulcers, venous ulcers, pressure ulcers, ulcers caused by mixed vascular etiologies, full-thickness & partial thickness wounds, donor sites and other bleeding surface wounds, abrasions. Box of 10 individually wrapped dressings.